Swimming, beach fun, and the finest sunsets are a 5-7 minute stroll around the corner at Peconic bay down the private beach access path. This charming cottage is 650 sq/ft with two bedrooms, living room, kitchen and bathroom with shower (2nd full bath in finished basement). The house sleeps four comfortably (two twin beds in kids room and a king in the master). New bathroom, state of the art climate control system, tank-less hot water heater so you never run out, hardwood floors, washer and dryer. There is a huge lawn with plush green grass, beautiful trees and flowers. 15 minutes to ocean beaches in Hampton Bays or Southampton. Aside from the renovated cottage itself, the convenient location with 5-7 min walk to private Peconic beach access allows for (without driving) spur of the moment swimming, walks on the beach, sunsets, etc. State of the art cooling and heating. Central air. Truly a Haven In The Hamptons! Privacy and convenience with all the comforts of home. Beautifully manicured property. We hope it is available next year when we come back. We loved it. 11-night stay and would have loved to stay longer. Truely a Haven in the Hamptons ! We just got back from another stay at the "Haven"
What a wonderful property.... beautifully landscaped and well maintained indoors and out. The outdoor shower and change room area is awesome especially when coming back from a day at the beach. Its a 5 minute walk to the local clean and private beach. A 15 minute drive to Tiana beach is where we enjoyed the ocean waves and breezes. It was lovely to be able to enjoy both beaches. The house has a simple, clean and current beach feel to it..... renovated bathroom, fully equipped kitchen, crisp white linens, comfy beds, walk out patio from the kitchen/living area to enjoy our morning cup of coffee/newspaper and an end of the beach day drink. Overall, the house has a relaxing and feel good vibe to it. A good variety of restaurants and deli's in the area to eat in / take away or pack up and go to the beach. Grocery store and liquor store only 5 minutes from the "Haven". All the Hampton villages are a quick drive away to walk and discover. Vincent takes pride in his home & community and was a gem to work with when planning our vacation. We recommend this "Haven in the Hamptons" and we will definitely return next year. I want to let you know my family had a great time out east this past week. You have a beautiful house and a gorgeous location. We enjoyed the bay which was only two blocks away, and the families within the area were very cordial. The bathroom was top-notch, bedrooms were large, laundry always a help with kids, and the kitchen provided everything for a short stay. The only comment was that some of the beds were very firm & uncomfortable. So we wound up purchasing an air mattress. Other than that, we had a fantastic time. Thanks again, looking forward to next season. The house is clean and recently renovated. The bedrooms are spacious. The common living area is smaller, but more than made up for by a really large back and front yard as well as covered outside dining area that we used a lot. The front and back yard were immaculately taken care of with nice flowers and trees. Please note, there is no dishwasher or tv connection (they do supply a lot of DVDs and there is WIFI throughout) but that didn't really bother us. AC works well which was important and beach was about a 5-10 min walk away. If you have an infant, bring a travel baby bath tub as there is only a shower there. Please do note that there is some traffic noise from the road, but with the windows closed and AC on at night, you don't really hear it. I would absolutely recommend this rental. There is now Optimum cablevision and Internet wi-fi. Loved the place. It is well kept, immaculately clean and the front- and backyard are well tended to, so it was fun for kids to play at. The house has all amenities, including super-fast WiFi (a must for us, even on vacation). The a/c is very efficient and cools the house in a blink - a saver during several hot days when we had to keep windows closed. The location is great - between the bay and the ocean, creating a pleasant breeze most times of the day. Another perk of the breeze - very few mosquitoes. The backyard has a nice tented seating area - very convenient for lazy dinners and suppers. Very close to the bay beach, with private access - water being much warmer that the ocean and, not less important, very few people know about that spot, so kids (and adults alike) can play and quietly (that part for adults) relax. A short drive to the ocean beach as well, and to shopping. Will come again next time we spend vacation on the Island. It’s just fifteen minute drive on country roads to ocean beaches in Southampton or Hampton Bays (Coopers beach). Only a 15 minute drive to the restaurants and shopping in Southampton. Have a picnic and at Agwam Park, which has art fairs and entertainment throughout the summer as well as nice playground. You have a choice of movie theatre in Southampton or Hampton Bays. Toward Hampton Bays is Spellman’s marine at the Shinnecock Locks, a major marine center where you can rent a slip or a boat. You can moor your boat on Peconic bay so it’s just minutes walk from the house. The bay is great for water skiing. Consider it your own huge swimming pool. The Southampton Peconic Beach and Tennis club (107 North Rd.) is minutes from your path where there are a multitude of recreation and instruction opportunities for all ages. 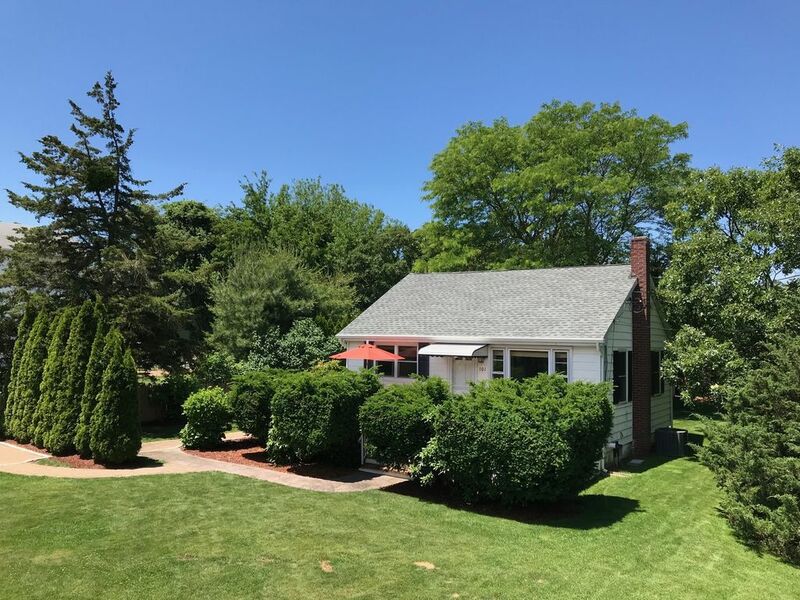 Located right between Hampton Bays and Southhampton on North Road, this is an ideal spot to access much of the best activities available on the east end of long Island. Private Golf clubs Shinnecock Hills, Sebonic, and National golf courses are within three miles. Public courses are in Riverhead about 30 min. West. Montauk Downs is another public course about 35 miles east. “Fridays at five” lecture series on the lawn at the Bridgehampton Library a great opportunity to meet your favorite authors. Absolutely no smoking or pets. Turnover days are usually Saturday (not mid-week).